The DFE II Series is a compact, easy-to-use force gauge, designed for economy applications without compromising functionality. 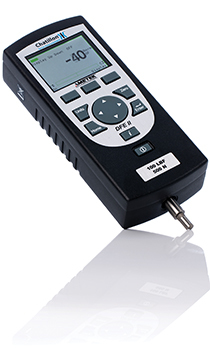 This digital force gauge is ideal for handheld or test stand applications and is available in several capacities. The Chatillon DFE II Series marks a new era in digital force measurement. This compact, easy-to-use digital force gauge is designed for economy applications without compromising functionality. It is ideal for hand held use, as well as for test stand applications. This digital force gauge is often used for collecting production sample data at the end of a production line, for performing pass/fail tests, or (when mounted to the Chatillon LTCM test stand and connected to a computer) for online recording of quality testing data for incoming material inspection conformance. A large, easy-to-read, high resolution dot matrix LCD full color display supports a variety of standard gauge functions, including normal and peak read¬ings, high/low limits, set points, pass/fail results, statistical results, load cell actuation and direction. The DFE II features an integral load cell with a measurement accuracy better than ±0.25% FS, and has analog, USB and RS232 serial communication. The display can be inverted and displayed results may be “hidden” from the operator. Expand the functionality of your DFE II force gauge even further with the advanced ForceTest software. Find out which adapter you need for your DFE II digital force gauge in this Connection Diagram. Request more information to see how we can help you with a force gauge solution that suits your need. Find the Declaration of Conformity for the DFE II Series force gauge here. LTCM-100 Firmware Version 1.11 01-Oct-13. Initial Release.